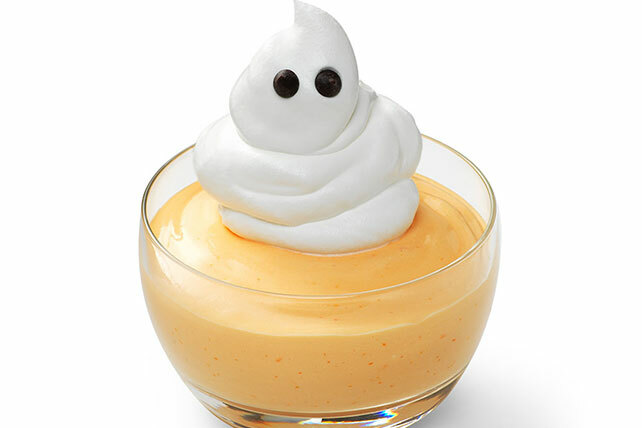 Don't get tricked, create a delicious Halloween treat with these Boo-tiful JELL-O® Cups. These spirited JELL-O® cups are quick and easy to put together. Add boiling water to gelatin mix in large bowl; stir 2 min. until completely dissolved. Add ice; stir 3 to 5 min. or until gelatin is thickened. Remove any unmelted ice. Whisk in 1/3 cup COOL WHIP until blended. Pour into 4 dessert dishes. Refrigerate 30 min. or until firm.